The general election result was not an endorsement of austerity but was a stunning Tory tactical success. The Tories adopted a policy of defending key marginal seats against Labour and UKIP and attacking in Liberal Democrat seats. The strategy worked and lead to a Tory majority government for the first time since 1992. This was done on a swing of 0.8% to the Tories, with Cameron returned as Prime Minister with 36.9% of the vote, the lowest share in history. The coalition government meanwhile suffered an overall loss of 14.4%, but remarkably the Tories ensured that all of this loss was suffered by the Liberal Democrats. This represents the biggest ever loss by a governing party. But despite this rejection of austerity amid the biggest ever decline in living standards, the Labour Party still lost seats and lost the election. Labour was unable to make any inroads into their top target seats from the Tories and even managed to loss seats to the Tories. The Tory tactic of focusing all of their resources on defending their most vulnerable seats worked because Labour did not inspire the working class vote with a real alternative. Labour’s natural supporters were unimpressed with the austerity-lite alternative offered by the Labour Party. The economic policies just didn’t make sense and left the Labour unable to attack the Tories economic record. In May 2012 Labour had a commanding poll lead over the Tories, even allowing for shy Tories. Then Labour shifted to an austerity-lite agenda adopting Tory spending plans for the 2015/17. From this point on the Labour lead was eroded. Although Labour announced changes to the NHS, Bedroom Tax and Housing, this was all done within an austerity-lite agenda and all talk of growth through investment was dropped. 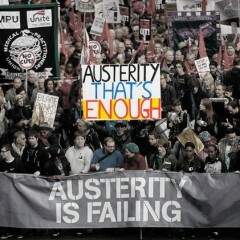 Austerity is massively unpopular. The Tories were forced during the campaign to make promises relating to new areas of spending, particularly around the NHS and public services, whilst refusing to say where the £12 billion welfare cuts was coming from. They got away with refusing to specify any real areas of cuts, including spending cuts to local government. This was a failure of Labour and contributed massively to their failure to win an outright majority. Labour made a massive mistake trying to take on UKIP on immigration. The controls on immigration mugs were a disaster and shamefully immigration was a central theme of Labour’s election campaign. It was noticeable how the Tories avoided talking about immigration and never mentioned quotas, unlike the Labour Party and UKIP. The Tories recognised that any talk of immigration only boosts UKIP. The Blairite right wing can hardly contain itself at the glee it feels at Ed Miliband losing the election and resigning as leader. They paint a picture that Ed was a puppet of the Trade Unions and adopted policies that were far too left wing for the British people. They say that Labour needs to move back to the centre ground and win back middle England. Yet this is from the same people who presided over losing five million Labour voters from 1997 to 2010 whilst Ed Miliband increased Labour’s vote by 600,000. A move back to the New Labour project and a more pro-business, austerity agenda is not the answer. In Scotland the Labour Party was wiped out by the SNP whose anti-austerity, anti-Trident message resonated with voters. In the Independence vote, every ward in Glasgow voted for independence, not because they suddenly became ardent Nationalists, but because they wanted an end to austerity and cuts in living standards. The SNP and independence seemed to offer a way out for working people. Instead of taking note of the independence vote, the Labour Party carried on portraying itself as fiscally responsible and pro-austerity. Scotland was lost last year when Labour went into the independence referendum in alliance with the Tories. In alliance with a party that only had 1 MP in Scotland, needless to say the consequences of that alliance endured, it’s now Labour, as well as the Tories and Liberal Democrats that have only 1 Scottish MP. The solution of electing Jim Murphy as leader ensured Labour’s defeat. The continuing pro-austerity, pro-trident message meant Labour was outflanked from the left by the SNP. A move to the right will ensure that Labour never regains those lost Scottish seats. The 50% share of the vote for the SNP in Scotland was higher than the 45% for independence. The Scottish people voted against austerity and trusted the SNP to do that. Yet strangely, other than Unite and ASLEF, there is no calling for Murphy to resign despite losing 40 seats in Scotland and seeing a massive erosion of support following his election as Leader of the Scottish Labour Party. The Tories have been elected with a historically low majority. They face enormous challenges over Europe, an escalation of their austerity agenda and a racist offensive. They were largely unchallenged over their economic plans and the scale of the cuts could potentially ignite a resistance greater than in the last parliament. They raised expectations over spending that they are incapable of carrying out. Over Europe, an in-out referendum will not be enough for UKIP and the Tory right who will demand an exit, and the Tories have no answers over immigration over than to further fuel racism. There is a massive opportunity for the Labour Party to exploit these Tory weaknesses by becoming an anti-austerity, pro-growth party. The Tories are still deeply unpopular and detested by a majority of the population. We need to remember that austerity was rejected by the electorate, despite what the Blairites argue. Ed Miliband accepted austerity as the way forward which is why he lost the election, moving to the right will not win the 2020 election for Labour. Looking forward the Tories won this election by executing their tactical plans not by the electorate endorsing their austerity plans of moving even more wealth to the rich. The Tories go into the next five years with spending promises they cannot fulfil with massive cuts to welfare spending. They are reduced to their heartlands and face internal conflict over Europe and immigration. Whether the Tories are successful will largely be determined by the level of struggle and if there can be a coming together of the progressive forces against austerity. Posted in: Conservatives, Macroeconomics, Migration/Immigration, Politics, Public Spending, SNP, UKIP. Whichever way you look at it they hammered Labour. It seems that not all of the country are feeling this austerity. But they are definitely feeling the effects of EU migration, and that’s what contributed to the defeat. Dave has put his hand on the bible of his Manifesto and sworn he will deliver, and that’s where Labour can get him. But only if we have the answers for pro-growth and much reduced immigration from the EU. I’m right guessing you’re not backing Andy this time?